After Epic Pluto Flyby, What's Next for NASA's New Horizons? Artist's concept of NASA’s New Horizons probe cruising through the Pluto system on July 14, 2015. NASA's New Horizons spacecraft has completed its highly anticipated close flyby of Pluto, but the probe's work at the outer reaches of the solar system is far from done. New Horizons zoomed within 7,800 miles (12,500 kilometers) of Pluto's surface on July 14, capturing the first up-close images of the dwarf planet and its moons. Though the spacecraft is now speeding away from Pluto into the depths of the frigid and faraway Kuiper Belt, it's still gathering data and beaming information home to Earth. "So we're looking back at the planet in that special geometry, looking at the night side and doing various experiments, and splitting our time downlinking data," Stern added. New Horizons collected about 50 gigabits of data during its nine-day-long "close-approach" phase of operations, which ended Thursday (July 16). As of Friday, less than 2 percent of that information had come down to the ground, Stern said. New Horizons is initially sending home compressed versions of its data files, to get them back to Earth relatively quickly. A concerted effort to get all the flyby data down in compressed form will begin in September and should take 10 to 12 weeks, Stern said. The complete dataset of uncompressed files, meanwhile, should be on the ground by late 2016, NASA officials have said. But that milestone may not mark the end of New Horizons' work, either. Stern and the rest of the team would like to send the spacecraft on to study another Kuiper Belt object (KBO) up close during an extended mission, and they've already identified two potential targets for this second flyby, which would likely occur in early 2019. Both bodies — named 2014 MU69 and 2014 PN70 — lie about 1 billion miles (1.6 billion km) beyond Pluto, which is nearly 3 billion miles (4.8 billion km) from Earth at the moment. 2014 MU69 and 2014 MT70 are both several dozen miles wide, so they're very different objects than Pluto, which New Horizons revealed to be 1,473 miles (2,370 km) in diameter. A decision on which body to fly by will be made soon; minimizing the fuel needed to get to New Horizons' next target requires firing up the engines by this fall, mission team members have said. That engine burn will therefore probably be performed before NASA officially approves and funds the potential extended mission. 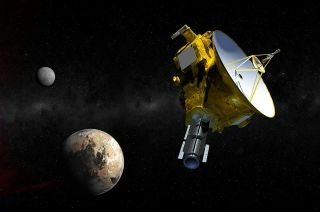 "The proposal to explore additional KBOs will be due in 2016; it will be evaluated by an independent team of experts to gauge its merit: the team will evaluate the health of the spacecraft and its instrument payload, the value of the science New Horizons can do at a KBO, the cost of the flight to and the exploration of the target KBO, and more," New Horizons team members wrote in a description of the mission's timeline. "If it recommends funding and NASA approves, the New Horizons Extended Mission would begin in 2017, allowing the team to plan and test the encounter (which would take place one-two years later) and to continue to operate New Horizons," they added.